261 Marlborough is located on the north side of Marlborough, between Exeter and Fairfield, with 259 Marlborough to the east and 275 Marlborough to the west. 261 Marlborough was designed by architect Charles Brigham and built in 1887-1888 by L. D. Willcutt, builder, as the home of Henry Austin Whitney. He is shown as the owner on the original building permit application, dated February 21, 1887. He also maintained a home in Milton. Henry Whitney was a wholesale boot and shoe manufacturer, banker, and president of the Boston & Providence Railroad. 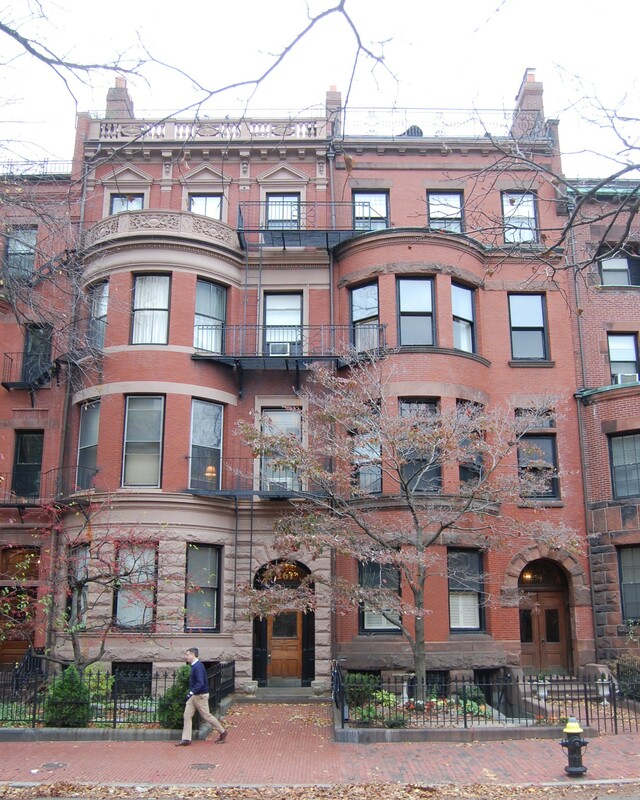 He previously had lived at 54 Boylston, where his wife, Mary Frances (Fanny) (Lawrence) Whitney, had died in January of 1883. On January 24, 1887, Henry Whitney purchased from Martha Anna White the six inch strip of land to the east, including the western half of the party wall with 259 Marlborough, where Martha Anna White and her husband, Dr. James Clarke White, had built their home in 1884-1885. He purchased the remainder of the land for 261 Marlborough from the Commonwealth of Massachusetts on May 19, 1887. Click here for an index to the deeds for 261 Marlborough. Henry Whitney died in February of 1889 and 261 Marlborough was inherited by his five surviving children: Joseph Cutler Whitney; Ellerton Pratt Whitney; Elizabeth (Whitney) Minot, the wife of Dr. James Jackson Minot; Constance Whitney; and Hugh Whitney. On May 14, 1890, 261 Marlborough was purchased from the Whitney family by Samuel Dennis Warren, Jr. He and his wife, Mabel (Bayard) Warren, made it their home. They previously had lived at 151 Commonwealth. Samuel Warren had been an attorney in partnership with future Chief Justice Louis D. Brandeis. In 1888, after his father’s death, he had withdrawn from active participation in the firm and assumed management of his father’s paper manufacturing company, S. D. Warren & Co. The Warrens also maintained a home, Karlstein, in Dedham, where Samuel Warren died in February of 1910. Shortly before his death, the Warrens had been joined at 261 Marlborough by their son and daughter-in-law, Samuel Dennis Warren, III, and Helen (Thomas) Warren. They had married in June of 1909, after which they had lived in Germany, where he worked in a paper mill. They returned to Boston in January of 1910 and he joined S. D. Warren & Co. By the 1911-1912 winter season, they had moved to 282 Marlborough. Mabel Warren continued to live at 261 Marlborough. During the 1913-1914 winter season, Mabel Warren was living elsewhere and 261 Marlborough was the home of Dr. Elisha Flagg, a physician, and his wife, Eleanor Amelia Marguerite Cecilia (Shattuck) Whitney Flagg. They previously had lived at 199 Commonwealth. Eleanor Flagg’s first husband had been Henry Austin Whitney’s son, Hugh Whitney, who had died in October of 1907, a suicide. The Flaggs moved back to 199 Commonwealth by the next season. 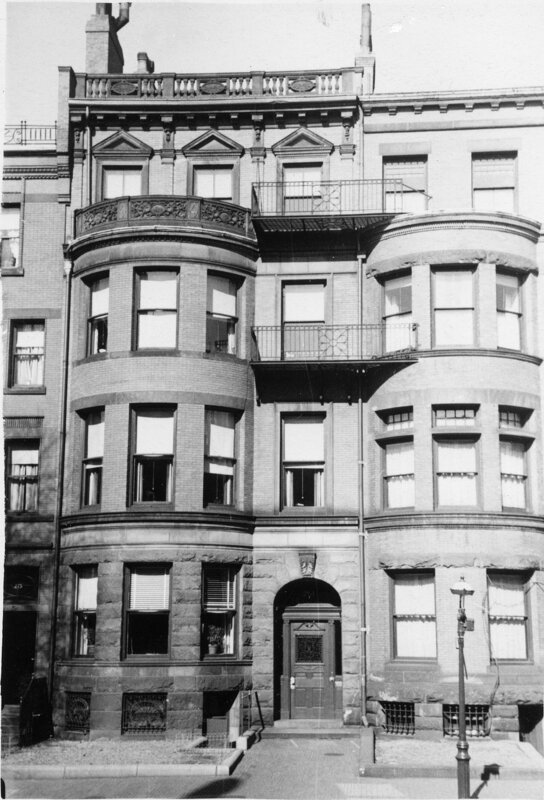 Mabel Warren resumed living at 261 Marlborough and continued to live there through the 1916-1917 season. She then lived elsewhere again for several years. By the 1917-1918 winter season, 261 Marlborough was the home of Dr. George Hayward Binney, Jr., a physician, and his wife, Susan Jeannette (Appleton) Binney. They previously had lived at 447 Beacon. He maintained his medical office at 45 Bay State Road. They continued to live at 261 Marlborough during the 1920-1921 season, but moved thereafter to 6 Commonwealth. Mabel Warren resumed living at 261 Marlborough. On November 1, 1923, she transferred 261 Marlborough to her son, Bayard Warren, as trustee on her behalf. She lived elsewhere during the 1923-1924 season and died in May of 1924. During the 1923-1924 winter season, 261 Marlborough was the home of Edward Pierson Beebe. He previously had lived in Brookline. He also maintained a home, Highfield Hall, in Falmouth. By the 1924-1925 season, he had moved to 303 Commonwealth. In October of 1924, 261 Marlborough was acquired from Mabel Warren’s estate and trust by her daughter-in-law, Helen (Thomas) Warren, the wife of Samuel Dennis Warren, III. They previously had lived at 282 Marlborough. Samuel D. Warren, III, died in January of 1927. 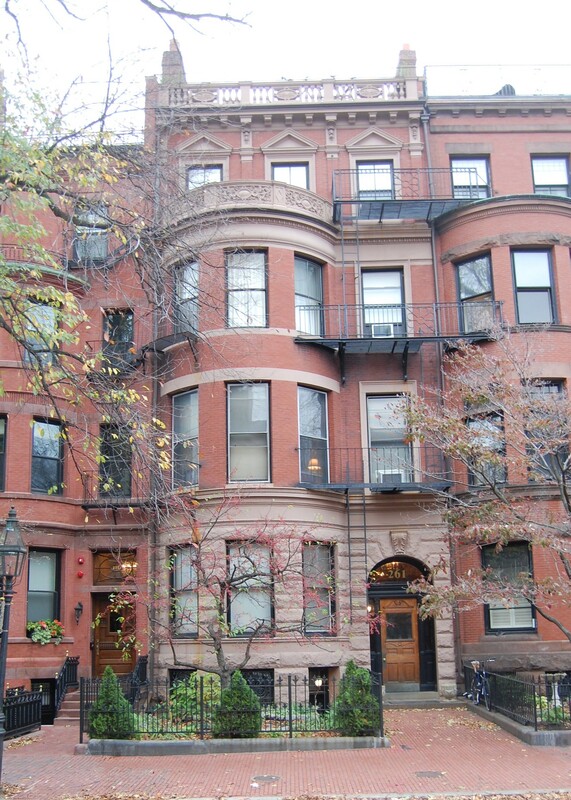 Helen Warren continued to live at 261 Marlborough with their children: Helen Warren, Anne Warren, and Samuel Dennis Warren, IV. During the 1934-1935 winter season, Helen Warren and her children were traveling abroad and she leased 261 Marlborough to William Marshall Bullitt and his wife, Nora (Iasigi) Bullitt of Louisville. William Bullitt was a lawyer in Louisville and former US Solicitor General during the Taft Administration. They were in Boston to “present” their daughter, Nora Iasigi Bullitt, as a debutante. Helen Warren and her children resumed living at 261 Marlborough in 1935 and continued to live there in 1937. By 1938. she had moved to 166 Marlborough. On December 21, 1937, 261 Marlborough was acquired from Helen Thomas by the Marlborough School. It also owned 245 Marlborough and 227 Commonwealth, and in December of 1939 would acquired 247 Marlborough. In July of 1938, the school applied for (and subsequently received) permission to construct fire escapes and balconies in order to convert the property from a single-family dwelling into a school dormitory. On December 30, 1939, 261 Marlborough was acquired from the Marlborough Schools, Inc., by the Chandler School for Women. It acquired 245 Marlborough, 247 Marlborough, and 227 Commonwealth on the same day. In May of 1943, the school applied for (and subsequently received) permission to convert the property from a dormitory into a lodging house. On June 19, 1945, 261 Marlborough was acquired from Chandler School by real estate dealer Howard S. Cosgrove, and on July 17, 1945, it was acquired from him by Joffre Gotreau, who operated it as a lodging house. He previously had lived at 441 Marlborough with his mother, Martha M. (Roy) Gotreau, widow of David B. Gotreau. In January of 1947, he applied for permission to convert 261 Marlborough from a lodging house into a lodging house with two apartments. He subsequently abandoned the permit. He continued to live at 261 Marlborough and to operate it as a lodging house. He also was listed in the City Directories as operating lodging houses at 437 Marlborough and 441 Marlborough, and later also 439 Marlborough. In March of 1956, Joffre Gotreau applied for (and subsequently received) permission to convert 261 Marlborough from a lodging house into thirteen apartments. He continued to live in one of the apartments until the early 1960s. On March 31, 1960, 261 Marlborough was purchased from Joffre Gotreau by Max J. Allen and Paul M. Thorner, trustees of the University Realty Trust. The property changed hands and on April 1, 1969, was acquired by Pierre Louis Bourgknecht. He also owned 259 Marlborough and in July of 1969 would acquire 257 Marlborough. In July of 1969, he applied for (and subsequently received) permission to cut an opening on the fourth floor between 261 and 259 Marlborough to provide access to the elevator at 259 Marlborough. On May 29, 1985, 261 Marlborough was purchased from Pierre de Bourgknecht by John R. Giles, trustee of the 261 Capitol Realty Trust. On the same day, he also purchased 259 Marlborough as trustee of the C. D. C. Pension Realty Trust. In July of 1985, Pierre de Bourgknecht sold 257 Marlborough to another purchaser. 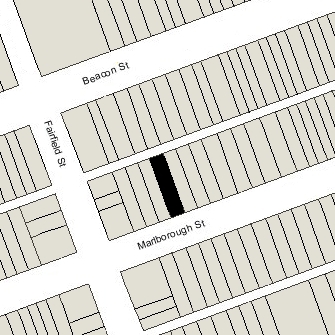 On September 30, 1985, John Giles converted 261 Marlborough into thirteen condominium units, the 261 Marlborough St. Condominium.